Hold the mulled cider... and reach for the Tabasco, as Louisiana heats up for a fais do-do for the holidays! There won't be a snowflake in sight, but count on thousands of colorful twinklers, fireworks and a unique Cajun tradition - crackling Christmas bonfires - to light up the night sky in December. New Orleans lights up the night at City Park. • In Cajun country, Santa Claus is known as Papa Noël. Instead of delivering gifts by sleigh and reindeer, he travels in a boat pulled by eight alligators. 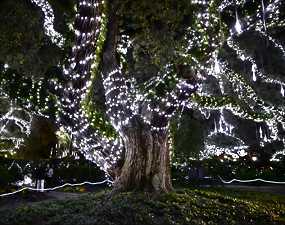 • The Celebration in the Oaks in New Orleans is considered one of the grandest in the nation with the' City Park's ancient oak trees aglow in hundreds of thousands of twinkling lights. More colorful light displays meander through 25 acres of the park including the Botanical Garden, Storyland, and Carousel Gardens Amusement Park. • The tradition of holiday bonfires was first introduced to the levee by French Marist priest in the 1800s. Today, bonfires are lit in St. James Parish in and around New Orleans every year accompanied by fireworks displays on Christmas Eve to light the way for Papa Noel. Christmas New Orleans Style - Check out information on top holiday events including bonfires, caroling, lighting ceremonies, historic home tours, and lots more. Baton Rouge Downtown Christmas Parade - Floats, horses, marching bands, caroling and more on view at the capital city's big holiday extravaganza with this year's schedule and information on related travel packages. Festival of the Bonfires - Christmas Cajun style with the annual holiday bonfire tradition at Lutcher Recreation Park including scheduled entertainment and activities plus tourist information, maps & directions. Oak Alley Plantation's Annual Christmas Bonfire Party - An elegant celebration of Creole Christmases past in Vacherie with this year's schedule, ticket information, the complete dinner menu and information on entertainment highlights. Lake Charles Light Up The Lake Celebration - Information on the annual lighting ceremony, lighted boat parade and fireworks display, plus an overview of other holiday happenings in Lake Charles. Christmas Festival of Lights in Natchitoches - The big event that draws thousands each year for the annual Christmas parade, the food, the music, glittering lights and spectacular fireworks over Cane River Lake.